Many amateur golfers tend to slice the ball. A slice is a golf shot that curves from left to right. A moderately sliced ball is often called a fade. Amateurs who slice often hit tee shots that curve violently, termed a “banana ball.” Most accomplished players prefer to learn how to hit a draw, which curves gently from right to left. Tee shots hit with a draw tend to go farther because they get more roll when then hit the fairway than a sliced tee shot would. Jack Nicklaus says in his book, “My Golden Lessons,” that slicing a ball off the tee can be caused by grip pressure that is too tight. Holding on too tightly with the right hand doesn’t allow the hands to release—or rotate—properly through the impact area. The face of the club is left open and the ball curves to the right. Loosen your grip slightly with the right hand and you can achieve the proper release through impact and turn your slice into a straight shot or even a gentle draw. If you are deliberately trying to fade the ball, you would align your shoulders and feet left of target at address and open the club face slightly. Make sure you aren’t inadvertently lining up this way. Have one of your playing partners stand behind you and check your alignment, to make sure you aren’t setting yourself up for a slice. From time to time, most golfers find they have to go back and check their basic fundamentals, and alignment is one of these that golfers sometimes neglect. In the book “Breaking 100, 90, 80,” instructor Don Hurter suggests lining up with your hands positioned slightly in front of the ball as a way of helping to cure a slice. As you address the ball, take a look at your hands and observe that “Vs” are formed by the thumb and index fingers of each hand. If you turn the Vs a bit to the right, you are using what golf instructors call a strong grip. This grip encourages a ball flight that goes from right to left. If you are slicing the ball, experiment with turning the “Vs” to the right and you should be able to straighten out your shots, and eventually learn how to hit a controlled draw off the tee. 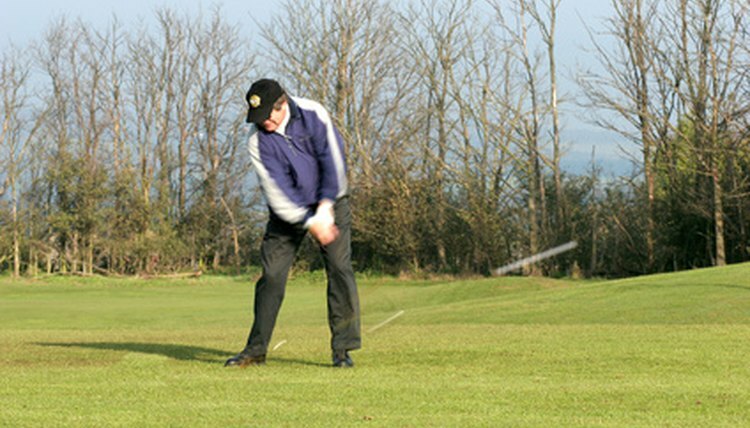 The position of the club at the top of your swing is an indication of whether you will slice the ball. Swing all the way back and pause. Your left wrist should be flat at the top of your swing. If it is cupped, or concave, you will most likely strike the ball with the club face in an open position, which causes a slice.